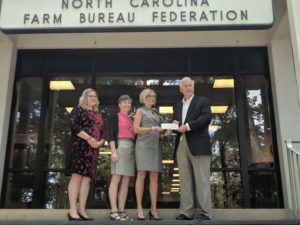 RALEIGH — North Carolina Farm Bureau President Larry Wooten presented a check for $10,000 to leaders of the Kenan Fellows Program for Teacher Leadership on May 25 at Farm Bureau headquarters in Raleigh. The award was the first installment in a five-year, $50,000 commitment pledged by N.C. Farm Bureau Board of Directors. The gift will support agricultural education through five fellowships in five North Carolina counties. Accepting the award were Elaine Franklin, Director; Lisa Hibler, Associate Director of Program Operations; and Kelly Vogel, Assistant Director of Development. In the last six years, local Farm Bureaus have contributed $95,000 to sponsor 11 Kenan Fellows across the state. Founded in 2000, the Program is an initiative of the Kenan Institute for Engineering, Technology & Science at N.C. State University. K-12 public school teachers are recruited annually for this year-long fellowship, which includes a summer internship with a mentor in a research or applied STEM setting and 80 hours of professional development. *This press release was reprinted courtesy of the NC Farm Bureau.